Elena Kagan (born April 28, 1960) is an American lawyer and judge. She is a United States Supreme Court Justice. She was confirmed by the United States Senate on August 5, 2010. She is one of three women on the court. Kagan is the only Supreme Court Justice who had never been a judge before becoming a Justice. Before being a Justice, she was Solicitor General and dean of Harvard Law School. Kagan was born and raised in New York City and is Jewish. ↑ Rajghatta, Chidanand (May 19, 2010). "PIO Neal Katyal poised to become US solicitor general". The Times of India. Times News Network. Retrieved December 9, 2010. ↑ Who's Who In America (2008). 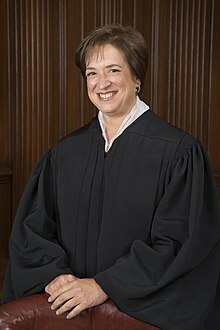 "Elena Kagan – WhosWhoInAmerica.Com". Marquis. Retrieved 2009-01-03. ↑ "A Climb Marked by Confidence and Canniness". The New York Times. Sheryl Gay Stolberg, Katharine Q. Seelye, Lisa W. Foderaro. 2010-05-10. Retrieved 2010-05-15. This page was last changed on 18 January 2019, at 00:49.